Formally announced on Wednesday, Jan. 20, 2010 at the weekly Saranac Lake Winter Carnival Committee meeting, Publisher Andy Flynn said the book will be filled with people’s favorite Winter Carnival memories. In addition, it will help raise funds for the Committee. “Saranac Lake Winter Carnival Memories” will be a memory book, not a complete history of the Saranac Lake Winter Carnival, which traces its roots to a small festival in 1897 during the tuberculosis-curing days. The Pontiac Club organized and hosted the event during the early years. The Ice Palace, a long-held Winter Carnival tradition, was first built for the 1898 Carnival, when hundreds of visitors traveled to Saranac Lake for the festivities by train. Every good story has a theme. Residents are asked to pick one memorable moment from a past Saranac Lake Winter Carnival, good or bad, and explain why it was so memorable. Give details, give names. Describe the scene. How did it affect you or others? Were you a king or queen? If you choose to write about a Winter Carnival artifact, explain where you got it or how it was used and submit a photo. People may submit essays of no longer than 450 words and/or a maximum of two photographs. Poems and illustrations are also accepted. The inside pages will be black and white. Entry/permission forms and Rules & Directions are available as PDF downloads at Hungry Bear Publishing or by contacting Andy Flynn at 40 McClelland St., Saranac Lake, NY 12983, (518) 891-5559, or email at adkattic@yahoo.com. Entry/permission forms must be filled out and sent via snail mail to Hungry Bear Publishing, while essays and photos must be sent via email. Specifications are listed on the Rules & Direction form. 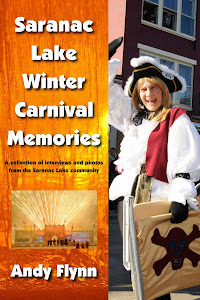 “Saranac Lake Winter Carnival Memories” will be released in the fall of 2010, just in time for the Christmas shopping season. The deadline for submissions is April 30, 2010. 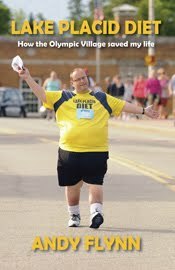 Cover photos for the book were provided by Mark Kurtz Photography, of Saranac Lake. Mark Kurtz is the official photographer for the Saranac Lake Winter Carnival. One photo shows the fireworks display over the 2008 Ice Palace, and the other photo shows one of the famous Lawn Chair Ladies, Saranac Laker Sue Grimm, in action during the 2009 Gala Parade. Based in Saranac Lake, Hungry Bear Publishing produces community-based publications and programs promoting the heritage and towns of the Adirondack region. In 2008, the company was awarded a Certificate of Commendation from the Upstate History Alliance for the Adirondack Attic History Project, which Andy Flynn founded in 2003 to actively preserve Adirondack history by collecting artifact-based, human-interest stories. Those stories have been compiled into the five-part “Adirondack Attic” book series. Hungry Bear Publishing also produces the Meet the Town community guide series and most recently published the re-print version of “Mostly Spruce and Hemlock,” the classic history of Tupper Lake by Louis Simmons, a project that was a fundraiser for the Goff-Nelson Memorial Library.